A mix of turquoise heishi from Kingman, Arizona, and azurite heishi from Mexico. 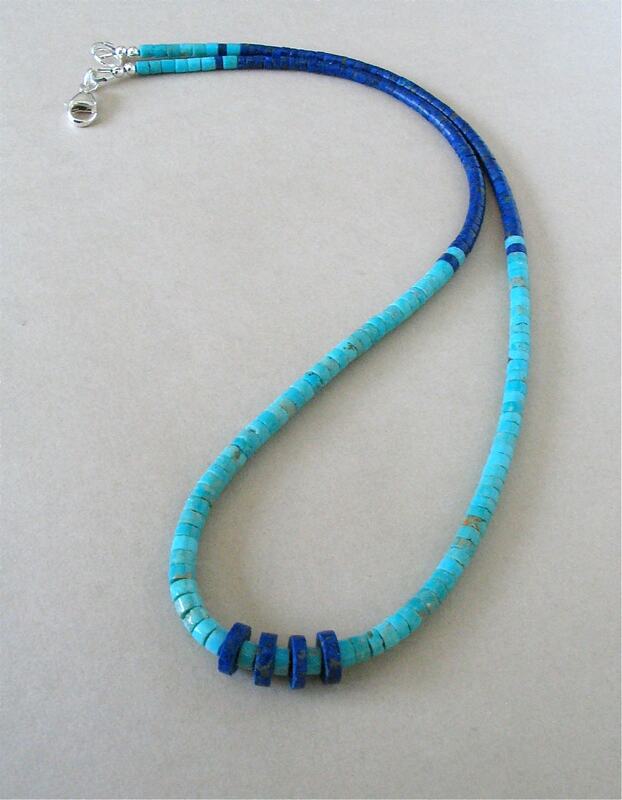 The smallest heishi beads are 3mm, graduating to 4mm, with a few larger 8mm azurite heishi beads in the center. Finished off with a sturdy sterling silver lobster claw. This is classic American southwest style! Looks great by itself or stacked with other necklaces. Suitable for both men and women. Be sure to look at the last photo where I have placed a dime next to the necklace so you can see the size of the beads. This necklace is 20 1/4 inches long. Kingman Turquoise Heishi and Red Bamboo Coral Necklace - Classic American Southwest Look - Tiny 2mm Heishi, 3mm x 12mm Tube Beads - 20 3/4"
Great looking bracelet!!! Thank you Nan. Subtle sparkles from the stones in the bracelet are priceless. A stunning pair of earrings that emit that great jingle sound I like to hear when wearing dangle earrings.